Air Borne Contamination is an undesirable by-product of the changing lifestyles of mankind. Greater demand for more efficient products and services has led to rapid industrialization, which in turn has put excessive pressure on the environment into accepting higher than safe levels of pollutants that it can safely eliminate. Atmospheric air, especially in manufacturing industry, is laden with gaseous chemicals of the likes of hydrogen sulphide, sulphur dioxide, nitrogen oxides, chlorine, ammonia, mercaptans, hydrocarbons etc. Needless to say, these are generated during the manufacturing processes, and eventually mix with the surrounding air. Common examples are fuel combustion related by products, gases generated during complex chemical processes, automotive fumes, etc. Other than the problem of ‘outside’ impure air, in many cases, such as in enclosed commercial establishments, contaminants are generated either from or within the space, eg. tobacco smoke, formaldehyde and other organic compounds from paint and furnishings, food smells etc. Bry-Air Ecoscrub Gas Phase Filtration system is the ideal and most cost-effective solution for Air Borne Contamination. It’s unique process not only cleans the contaminated air of suspended particles and corrosive gases but is also used for odor removal, making the working environment healthy for you and your electronic equipments. 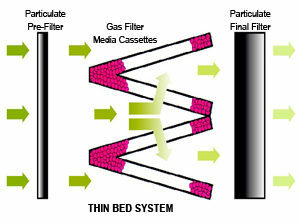 How does gas phase filtration system work ? The process of gas phase filtration is simple. The contaminated air first passes through pre-filters which trap the suspended particles, and then through the required chemical media beds, which chemically destroy or retain any remaining gaseous impurities. The chemical media can be activated carbon and / or activated alumina impregnated with proprietary chemicals, used alone or in combination – depending on the types and concentrations of the impurities present in air stream. Ecoscrub Systems are designed to operate and maintain contaminant gas levels at 1 ppb (parts per billion) or less. Essentially consist of either single or multiple, perforated hollow housing(s), also called bed(s) filled with chemical media, of at least 305 mm (12” or 1’) thickness. These beds are placed perpendicular to the direction of flow of air. 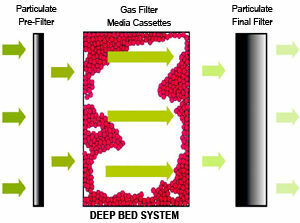 Deep bed systems are used for ‘pressurization’ applications in Industry, wherein level of air borne contamination is very high and good quantity of media holding is a necessity for prolonged uninterrupted use, before media gets completely spent and replacement becomes inevitable. Deep bed systems are powered units of horizontal configuration. Consist of either single or multiple stages of hollow, perforated, retractable ‘V’- shaped module(s), also known as cassette(s) filled with chemical media, of either 25 mm (1”) or 75 mm (3”) thickness. These cassettes are placed in the path of airflow. The other major parts include a set of pre-filters, final filters, fan/blower assembly and control panel, other than pressure-drop measuring gauges. Thin Bed Systems are used for ‘re-circulation’ applications in Commercial / Industrial sector, as well as for ‘pressurization’ in industrial environments where air contamination levels are on the lower side. Media holding capacity and pressure drops are smaller than Deep Bed units, in this case. Thin Bed systems can be powered as well as un-powered units of both horizontal and vertical configurations.